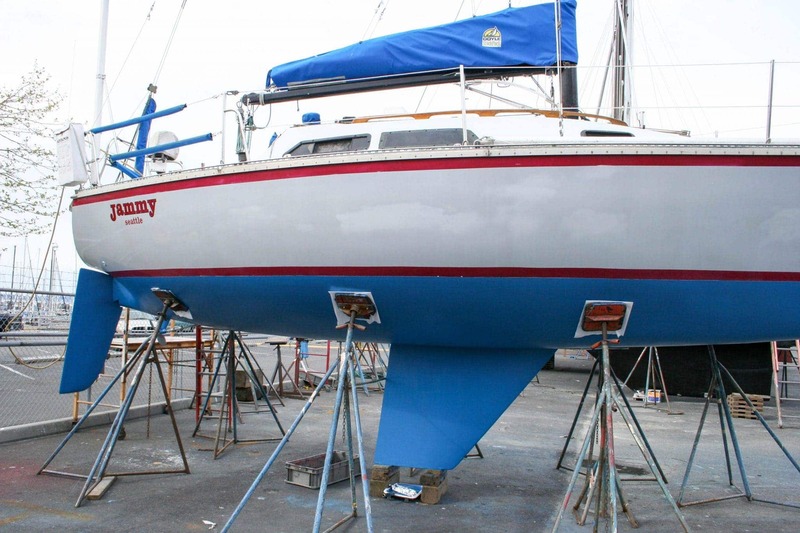 This last week I finished off a bunch of work on the sailboat and it was re-floated after the bottom was painted (them), topsides were waxed (me), and hull was waxed (them). There was a bunch of work on thru-hulls to make sure they were safe – we found one that was not even clamped on the far end! The big job was removing the shaft and propeller and replacing the PSS shaft seal that had been there since who-knows-when. As far as we could tell, the old one was so old it was made of some sort of rubber and didn’t have much spring left in it, which is important in it’s operation. The most annoying thing was at low idle, when a loud banging noise was produced. I originally wrote about this back in 2008 right after my new engine was put in. The noise never got any better than that visit, and it was still really loud and annoying. My bigger worry was what it was doing to the shaft, shaft log, and anything else. The good news is that it appears to have been the PSS – replacing it with a modern one has resulted in virtually no noise at idle. And, the guy who did the repair talked with Coastal Marine Engine, the place I had the new motor put in from, and they think adjusting the idle might help get rid of it completely. Sadly, while I was in the boat yard, the folks who did the waxing found a lot of problems with my paint job on the hull. The red stripes above and below the blue color are coming off rapidly, and look poorly painted. The blue center section has a lot of patch jobs where the previous owner tried to match colors of paint, and failed miserably. You can see it quite obviously in some of my close up pictures which I will post in a few days. So, I’m faced with repainting things completely, which is pretty expensive, and requires removing the mast and all standing rigging so they can wheel the boat in and out of their paint sheds. Seaview West, where I go, uses Alexseal paint which seems to have a good following – it’s claim is that it is much easier to repair than Awlgrip and it’s similar types, but still looks close to those types of paints. I’m going to do a bit of research, as I don’t plan on having her painted until November of this year, and hopefully I’ll find exactly what I want, color, type, etc. I also have engaged a friend in helping with the logo as that will have to be redone. The good news is that the bottom looks in really good shape, and is ready for another couple of seasons in the water. I intend on taking advantage of that this year!